Special Delivery Tee Design Review. 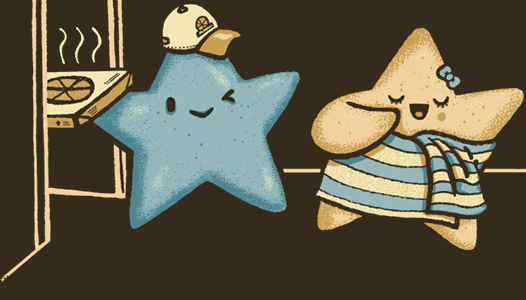 The Special Delivery tee design is well... imagine if the invincibility stars from the Super Mario Bros. franchise were doing as humans fantasize about doing. Such as the cliche pizza delivery man meets the hot woman in "nothing but a bath towel" customer. The concept is obvious and it has been done to some extent in various ways but this one is executed particularly well. Just that this features generic stars with eyes and unlike the Mario Universe these Stars have mouths and are different colors instead of only yellow. The targeted demographic is obviously adolescent males and frat boys. And yes, this is artwork is available on some kid sizes despite the innuendo. Special Delivery Tee Design By Walmazan. Soft Kitty Tee Design Review. 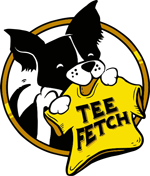 The Soft Kitty tee design depicts a cute white kitten acting out different and sometimes absurd scenarios to the words of the Soft Kitty song from the hit sitcom The Big Bang Theory. Above the word "Soft", the kitty sits in an ice cream cone. 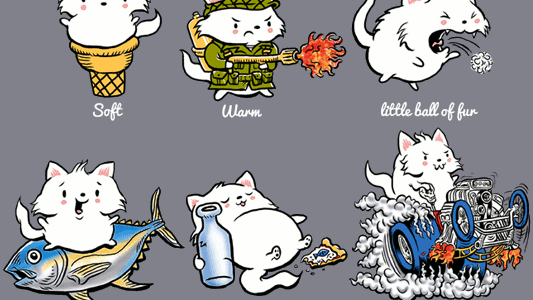 Above the word "Warm", the kitten is wearing military fatigues while wielding a flamethrower. Above the line "Little ball of fur", the cat is coughing up a massive hairball. Above the word "Happy", the feline smiles widely as it stands on a giant fish. Above the word "sleepy", the kitten is passed out from drinking a bottle of milk and a slice of anchovy pizza. Finally above the line "Purr Purr Purr", the kitty is revving the engine of a hot rod. This will make a great gift for fans of The Big Bang Theory. Soft Kitty Tee Design By lucky1988. The Dolphox tee design is one of the more clever or rather sly pieces of art to grace a torso. It is simple yet elegant at the same time. This is for the animal lovers. Especially, for the people that like foxes and dolphins but cannot decide which one that they like better or would prefer to wear on their chest. Because as you can see, it features both. People might see both species plain as day or just the fox depending on how their mind works. Utilizing the negative space in designs is tricky and Ross pulled it off flawlessly. 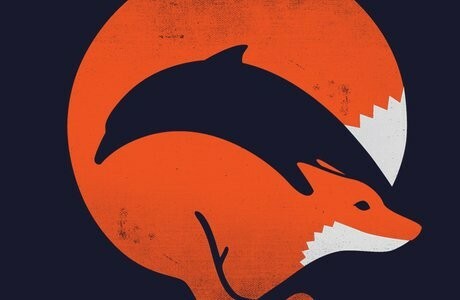 The subtlety of the dolphin is what makes this tee stand out from similar fox designs and logos. Add to that some slight distressing for a vintage look and it becomes fashionable. This combination of a dolphin and fox is perfect to wear anywhere. Dolphox Tee Design by Ross Zietz. Pocket Raptor Tee Design Review. The Pocket Raptor tee design is one of the best pseudo pocket designs that are flooding the market. It works well for Jurassic Park fans as well as dinosaur enthusiasts in general. What is not to like about this cute but terrifying little lizard? With nice coloring and shading this shows off some honed art skills. Just check out those sharp looking teeth! It would had been nice to see the raptor's claws "dig" into the fabric, or at least appear as though it was ripping through the pocket. But it is still cool regardless. This raptor is like the perfect nerd mascot, it has the right balance of being both geeky and badass. If only this was a real pocket, as the dino would make a much cooler version of a "pocket protector". This is the ideal tee to wear to a library or museum. 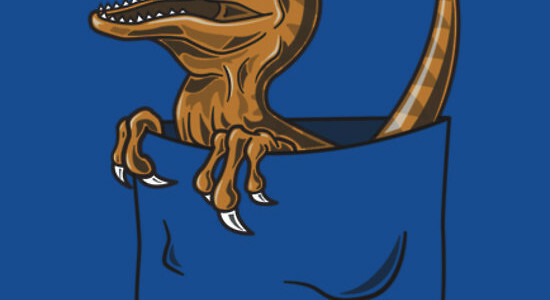 Pocket Raptor Design by Tabner. Kitchen Warfare Tee Design Review. The Kitchen Warfare tee is perfect for professional chefs and novice cooks alike. This shirt will make an ideal gift for anyone who loves the culinary arts, especially if they happen to be in the military or if they enjoy the competitive cooking TV programs such as Chopped or Cutthroat Kitchen. Making the kitchen aspect seemingly more masculine as opposed to the stereotypical view that the world has of the culinary field. 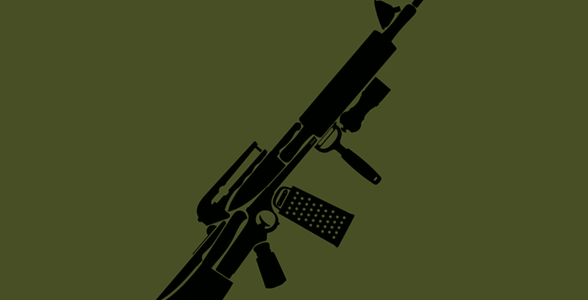 From far away this just looks like a typical M16 design but upon closer inspection the gun is made up of the essential kitchen utensils. In no particular order they are: a Fork, a Chef's Knife, a Cleaver, a Funnel, a Cheese Grater, a Measuring Spoon, a Garlic Press, a Filleting Blade, a Salt Shaker, a Long Reach Lighter, a Pepper Grinder, a Vegetable Peeler and a Rolling Pin. Seriously, this Kitchen Warfare design would make the wearer feel like a badass even if their weapons of choice are used to make a quiche. They say that "The pen is mightier than the sword", but only a true warrior can win a battle by winning over the enemy's stomach. This is especially true with poison but that is besides the point. Kitchen Warfare Tee Design by specsmachine.